CLICK HERE to see our tv ad. Welcome to the original Yoder's Roofing. Our commercial roofing company in Middle Georgia has been handling roof repairs, replacement and new installs for over two generations. We specialize in innovative roof coating solutions that can save almost any roof if you aren’t ready to do a tear off or replacement. In most cases, we can make your existing roof look and perform like new, without removing the old system. If your commercial roof has seen better days, needs frequent repairs, or has suffered from storm damage, contact our roofing company today! We will give you an affordable estimate to start earning you money by improving the quality of your commercial roof! Our roofing services can help you weatherproof your commercial roof against the elements that this area is predisposed to, and the troubles that can come with it. You won’t have to worry about frequent roof repairs anymore, your structure will be proofed against those problems. Our roofing systems will actually make your roof more energy efficient due to the technology we use and it will start lowering the cost of your AC bills monthly on an immediate basis. 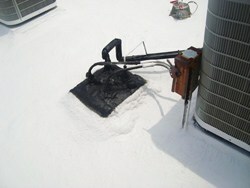 We have saved hundreds of commercial roofs in Atlanta and surrounding areas from needing a premature roof replacement. Our commercial roofing company uses the most up-to-date solution in the field of roof repair for aging, leaking and cracked roofs: roof coatings. We understand that every roof is different and needs custom options for its particular details and the problems it is experiencing. 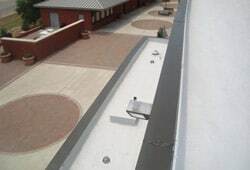 Our commercial roofers use techniques that will reduce your energy bills, make your roof more durable, lessen the load on your air conditioning equipment, and increase the comfort of the occupants of your building. No matter what commercial roofing system you have that needs repaired, we have you covered! Call us now to speak to one of our experienced roofers and let us provide a free estimate for your roof repair that can go beyond the usual. 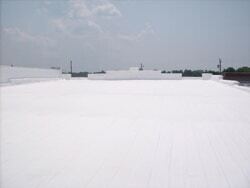 Commercial roof coatings are the cost-effective, affordable and long-lasting solution you have been hoping for! This is the solution for commercial buildings. Roof coatings not only repair, but also upgrade your existing roof and turn it into a system that benefits you each and every month for years to come. All of our roofing coating systems come in white and other light colors that markedly decrease the demand for cooling on the interior of your commercial or industrial property. They reflect 85% or 90% of the energy of the sun and decrease the load on your AC system and its workload dramatically. We are the industry leader in commercial energy conservation consulting and application of energy-efficient roofing. 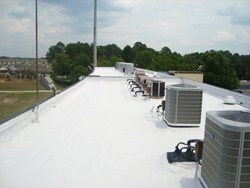 Trust a commercial roofing company who has the experience needed to handle all your roof coating needs. Call us today! Yoder's Roofing will provide the most up-to-date solution for aging, leaking, cracked commercial roofs. We offer Conklin roofing services that can transform your leaking or hot roof into a cool roof that saves you money every month. Conklin roofing is known for quality and longevity. We are confident that our commercial and industrial customers will reap the benefits in energy savings and durability. We are proud to offer these systems at an affordable rate. We also do roof repair on any Conklin roofing system you may already have. When you need a trusted commercial roofing company in Atlanta, Columbus, Albany or any surrounding area in Georgia, call us! Yoder's Roofing Co, LLC works with Conklin Roofing to bring you the most technologically advanced, state of the art roofing products available today. Conklin products are durable, cost-effective, and high-performing. 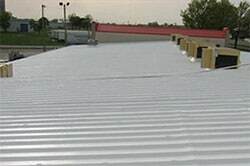 They are the industry standard for commercial and industrial roof coatings. in contact with your shortly.